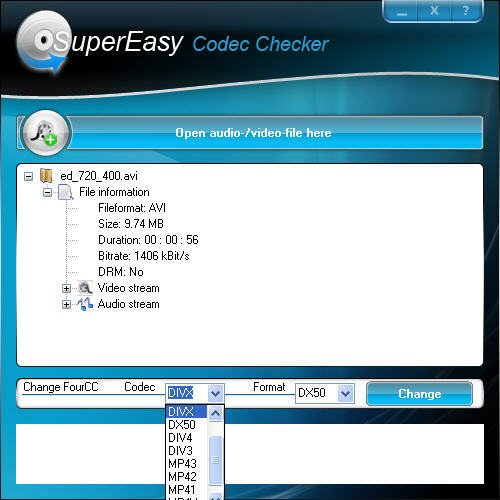 SuperEasy Codec Checker analyzes video clips and audio files and lists the found information in a clear tree structure. Classified by audio- and video stream and by used file format the software informs you about for instance resolution, frame rate, file container, audio- and video bit rate as well as about the used codec. SuperEasy Codec Checker has the ability to equip an AVI-File with a different identification. ...... player during recoding with our SuperEasy Video Converter for example. Quite a few AVI-Videos (like an Internet-loaded DivX- or Xvid-movie) are only rejected because their identification does not correspond to what your player expects. Identification is stored in the header of the respective file and indicates the video format as well as the video codec used for creation. DivX-certified MPEG-4-players in particular often insist on finding the character string 'DIVX' and/or 'DX..' in the header even if basically they would be able to play videos that were created by means of other codecs like e.g. HDX4 or Xvid. For these cases SuperEasy Codec Checker has the ability to equip an AVI-File with a different identification. You just select the desired character string from a drop-down-list and this makes your movie night. Even without recoding or laborious Internet-research for a suitable codec. Qweas is providing links to SuperEasy Codec Checker 1.09 as a courtesy, and makes no representations regarding SuperEasy Codec Checker or any other applications or any information related thereto. Any questions, complaints or claims regarding this application SuperEasy Codec Checker 1.09 must be directed to the appropriate software vendor. You may click the publisher link of SuperEasy Codec Checker on the top of this page to get more details about the vendor.